This simple yet rugged shirt is the perfect choice for hunters and adventurers of all sorts! Made from medium weight fabric, the Rogue Hunter Shirt is a rugged and efficient garment that is nothing short of a must-have for any medieval wardrobe. This garment is made from 100% cotton. It is far more durable than other lighter-weight fabrics used in dressier shirts, yet it is comfortable and breathable. The shirt is simple in design, featuring a flattened collar and an elongated neckline. The full-length sleeves are loose-fitting but not overly baggy. The shoulders, collar, neckline, and sleeve of this shirt are all accented with a different color from that of the body and sleeves of the shirt. The neckline and sleeve-cuffs close via laces and the sleeves are completely removable, which creates a truly unique and incredible look. The shirt is shown with a leather belt and black pants, which are not included but are available separately. 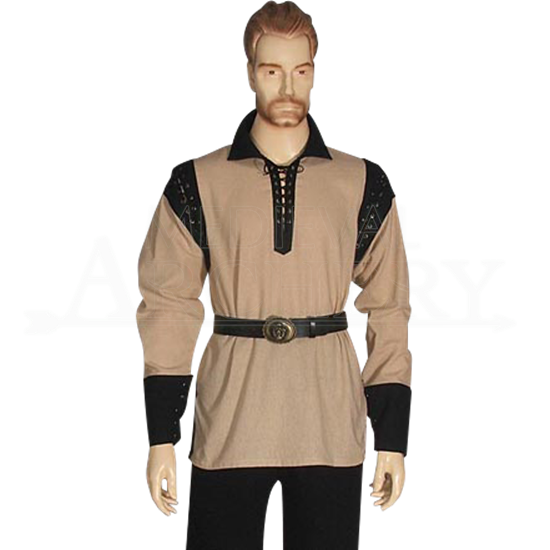 Given time, the Rogue Hunter Shirt is sure to become something of a work-horse in your medieval wardrobe. You will find yourself turning to it again and again, wearing it with all manner of different outfits and styles. The first color listed is for the main part of the shirt. The second color listed is the accent colors. Nice fabric, sturdy feeling, got it for LARPing in Red and Black. Looks great, haven't tried taking off the sleeves because it looks like a chore to put them back. Wore it around the house for a while, it can get a little warm (that's what the sleeves are for...).